The image on the right display the network diagram in your company. Designate one machine where the central repository will reside and install the Syncrify Server on this machine. The location of this machine does not matter. 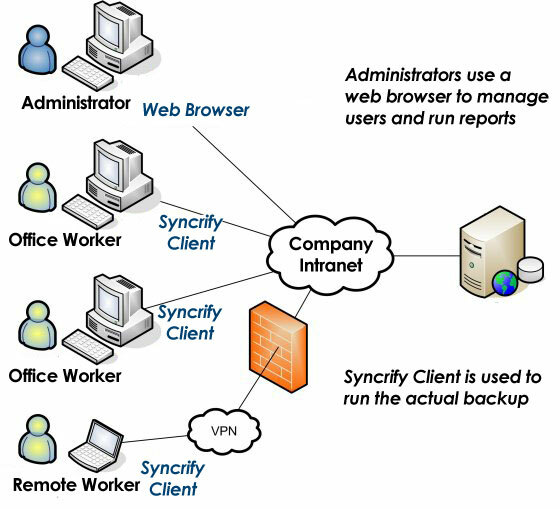 As long as it is accessible over the network to other computers on your network, you will be able to backup machines to this central repository. This machine should have a hard drive big enough to store backed up files from different location. Assume the host name of this machine is backup.yourCompany.com. After initial configuration, create a user account and specify a repository path where backed up files will be stored. Let's say this user's email address is userOne@yourCompany.com. On the machine where Syncrify server is installed. Most modern operating systems provide a built-in firewall preventing unauthorized access to the machine. You only need to open the port where Syncrify server is listening on. By default, this port is 5800 and administrators can change this to any other number less than 65,000. You should see the login window from any client machine. If you get an error, ensure the firewall is setup correctly and you can access the web interface of the server from the server machine itself. Install Syncrify client on the machine that needs to be backed up. Using the account you created in step 2, run a test backup. Click here for details on how to use it. Repeat this procedure and install the Syncrify client on every machine that requires to be backed up.